This season is over for the Saints, but that doesn’t mean there’s any down time yet for head coach Sean Payton and his staff. The team’s coaches now enters the early stages of helping the franchise’s front office craft the 2014 edition of the Saints, starting with sizing up how this season went for each individual player already in Black and Gold. "There is a process," Payton said. 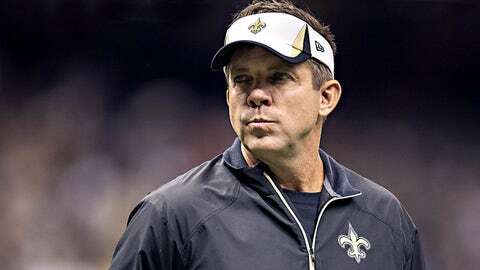 "The immediate focus this week for our coaching staff will shift on the 2013 Saints roster. This week will be spent on getting all the grades in, evaluations in, the plays, the graded plays." Payton and company are moving with a sense of urgency, working with focus and determination. After all, perhaps "busy" is the best avenue to move away from the reality that the Saints won’t be playing this weekend – a fact that’s still cutting and raw in New Orleans. "When does the loss go away? I think it takes a while," Payton said. "It is part of what drives you towards the next season: we don’t have another game to play. During the regular season you have a loss like that or a tough loss, quickly we can get onto the next game. When you have a postseason loss, it kind of stays for a while. We will have to swallow it. It will go down and we have to move on." The Saints will surely be looking at solving some questions on the offensive line, which allowed opponents to sack quarterback Drew Brees 37 times. Bret Ingalls did a solid job replacing Aaron Kromer as the offensive line coach, but with Brees another year older next year, protection will be key. Payton gambled boldly in the Saints loss at St. Louis when he called for rookie offensive tackle Terron Armstead to replace veteran Charles Brown on Brees’ blind side. Brown is scheduled to become a free agent March 11th, as are veterans Zach Strief, another offensive tackle, and center Brian de la Puente. "I was encouraged, especially as I gave them more and more opportunities both within the running game and the passing game," Payton said when asked to evaluate his offensive line. "The other night I thought we played very well. I thought we protected well the other night and ran the ball well. I think it’s a group we feel good about. Obviously we get some snaps to evaluate with Terron. Charles Brown played well for us early on, and we had just made that change. We’ve got veterans at a number of the other positions. I think we did a lot of things well. I think that group played well." On the other side of the ball, Rob Ryan’s defense succeeded in re-inventing itself, going from the worst in league history in 2012, into a top five unit in most categories. The last statistic is a problem that Ryan and crew will no doubt focus in on this off season. As they should, according to the Voice of the Saints Jim Henderson, who says turnovers were a key factor in the Seattle loss. "I don’t know how you change this, but when you’ve got a pass rush as good as the Saints is, and you’ve got talent on your defense that’s as good as the Saints is, why can you only force that many takeaways?" Henderson questioned. "29th in the NFL? You look at the Seahawks: they live and die by the takeway, mostly live. They are now +26 turnover differential at home since the 2012 season. They’re #1 in the NFL, the Saints are #29th. They get the only takeaway, turn it into a touchdown, and the Saints don’t even come close." Henderson expects the Saints to address that problem area by adding some new personnel. "When you look at all the injuries they had in the secondary, and the lack of play-makers they had back there as far as guys who can take the ball away – with the exception of Keenan Lewis – I think you’ve got to look at the secondary again," Henderson said. The Saints will have the 27th overall selection in the first round of the 2014 NFL Draft on May 8th.